(Alexandria, VA) – The National Sheriffs’ Association lauds today’s activation of the National Blue Alert System and hopes that it will curb the dangerous tide of deadly assaults on our nation’s law enforcement officers. Rep. Michael Grimm (R-NY) introduced the National Blue Alert Act on January 4, 2013. It passed the House on May 15, 2013 in a Roll Call Vote of 406-2. President Obama signed the bill into law May 19, 2015. The Act directs the United States Attorney General to establish a national Blue Alert communications network within the Department of Justice (DOJ) to disseminate information when a law enforcement officer is seriously injured or killed in the line of duty. Today we are witnessing the implementation of this network. This new National Blue Alert system will coordinate with federal, state, and local Blue Alert plans, and is being unveiled today with the hope that more lives of the men and women who serve in the line of duty can be saved. 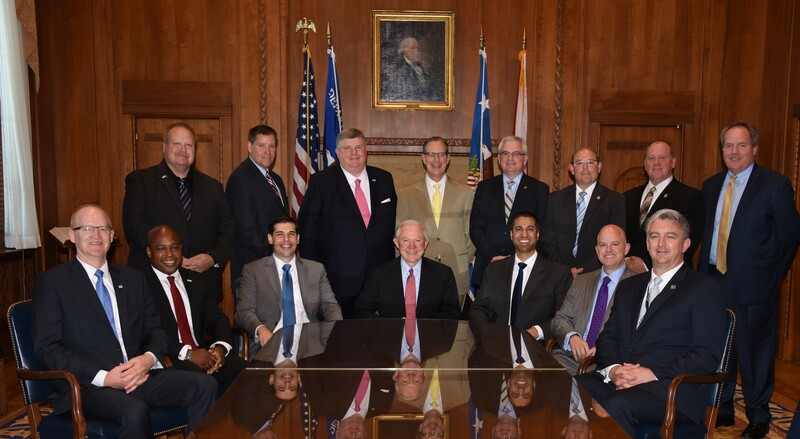 NSA Executive Director Jonathan Thompson, standing center behind Attorney General Jeff Sessions.